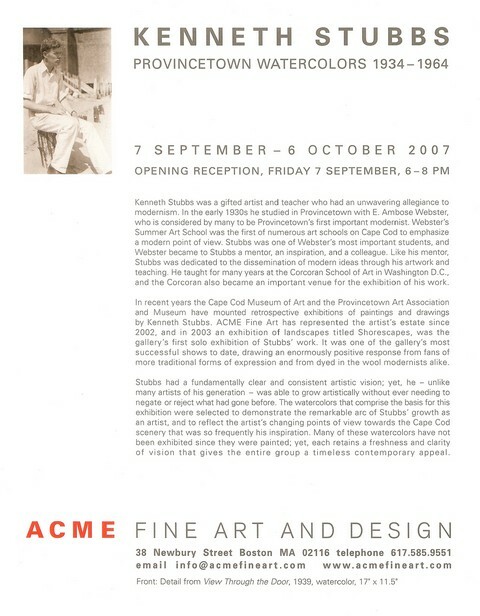 Kenneth Stubbs was a gifted artist and teacher who had an unwavering allegiance to modernism. In the early 1930s he studied in Provincetown with E. Ambrose Webster, who is considered by many to be Provincetown's first important modernist. Webster's Summer Art School was the first of numerous art schools on Cape Cod to emphasize a modern point of view. Stubbs was one of Webster's most important students, and Webster became to Stubbs a mentor, an inspiration, and a colleague. Like his mentor, Stubbs was dedicated to the dissemination of modern ideas through his artwork and teaching. He taught for many years at the Corcoran School of Art in Washington D.C., and the Corcoran also became an important venue for the exhibition of his work. Stubbs had a fundamentally clear and consistent artistic vision; yet, he -- unlike many artists of his generation -- was able to grow artistically without ever needing to negate or reject what had gone before. The watercolors that comprise the basis for this exhibition were selected to demonstrate the remarkable arc of Stubbs' growth as an artist, and to reflect the artist's changing points of view towards the Cape Cod scenery that was so frequently his inspiration. Many of these watercolors have not been exhibited since they were painted; yet, each retains a freshness and clarity of vision that gives the entire group a timeless contemporary appeal. 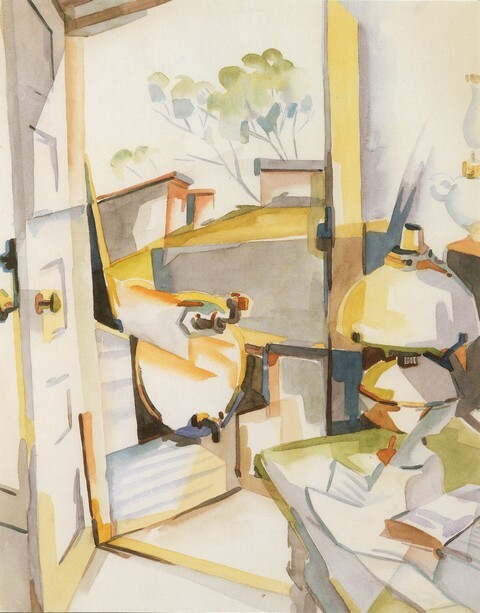 Front: Detail from View Through the Door, 1939, watercolor, 17" by 11.5"